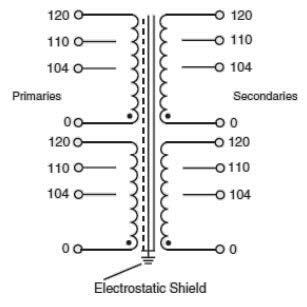 As shown in the schematic diagram this line of ESPEY products has dual primaries and secondaries. All four windings are identically rated so to permit series or parallel connections on either primary or secondary. This unit also allows the user to make auto-transformer connections by connecting a primary group in series with a secondary group. Insulation class is 130ºC standard, higher insulation classes are available.